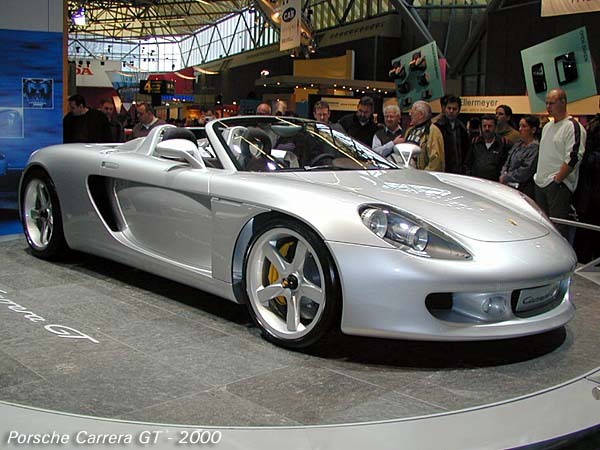 The Porsche Carrera GT (Project Code 980) is a mid-engined sports car that was manufactured by Porsche in Leipzig, Germany. The development of the Porsche Carrera GT can be traced back to the Porsche 911 GT1 and LMP1-98 racing cars. Due in part to the FIA and ACO rule changes in 1998, both designs had ended. Porsche at the time had planned on a new Le Mans prototype for 1999. The car was initially intended to use a turbocharged flat-6, but was later redesigned to use a new V10 engine, pushing the project back to planned completion in 2000. The V10 was a unit secretly built by Porsche for the Footwork Formula One team in 1992, but later shelved. The engine was resurrected for the Le Mans prototype and increased in size to 5.7 litres. Unfortunately the project was canceled after two days of testing for the first car, in mid-1999, mostly due to Porsche’s wish to build the Porsche Cayenne SUV with involvement from Volkswagen and Audi, thus requiring engineering expertise to be pulled from the motorsports division. It was also speculated that VW-Audi chairman Ferdinand Piëchwanted Audi’s new Le Mans Prototype, the Audi R8 not to face competition from Porsche in 2004. Porsche did keep part of the project alive by using the 5.5 L V10 from the prototype in a concept car shown at the 2000 Geneva Motor Show, mainly in an attempt to draw attention to their display. Surprising interest in the vehicle and an influx of revenue provided from the Porsche Cayenne helped Porsche decide to produce the car, and development started on a road-legal version that would be produced in small numbers at Porsche’s new manufacturing facility in Leipzig. 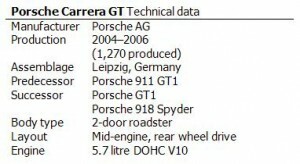 Porsche started a production run of Porsche Carrera GTs in 2004, shipping the units with an MSRP of $440,000 USD and a dealer invoice price of approximately $414,800 USD. In addition, the delivery charge could be as much as $5,000 USD. The first Porsche Carrera GT went on sale in the US on January 31, 2004. Originally a production run of 1,500 cars was planned. 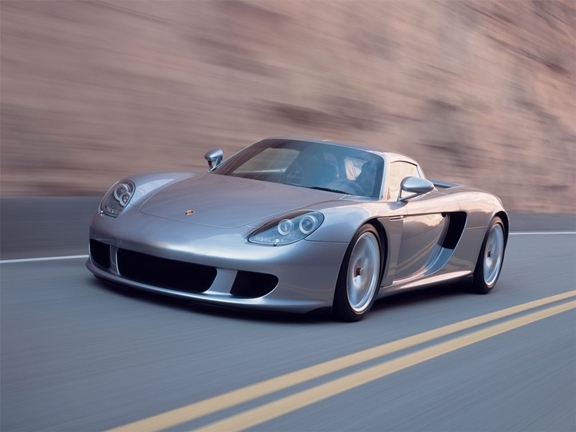 But Porsche announced in August, 2005 that it would not continue production of the Porsche Carrera GT through 2006, citing discontinuation was due to changing airbag regulations in the US. As of May 6, 2006, 1,270 GT’s had been manufactured, with 604 being sold in the United States. 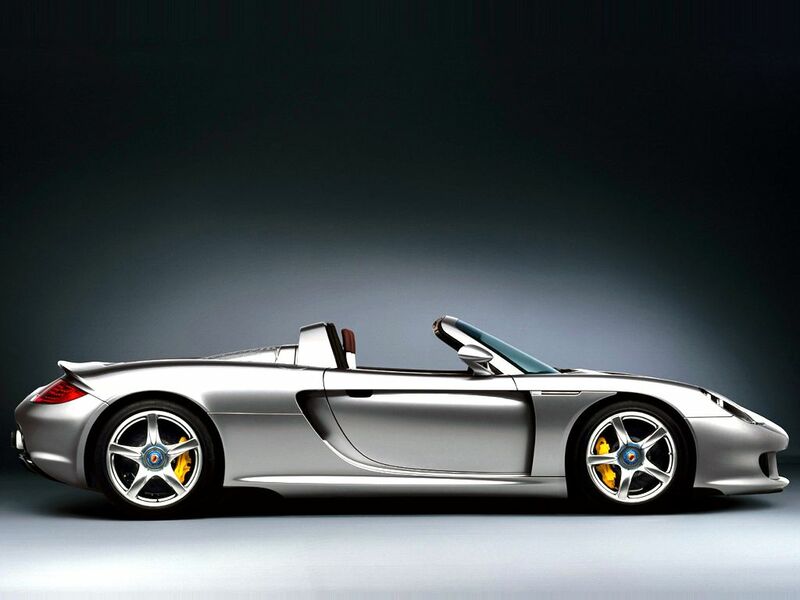 The Porsche Carrera GT is powered by a 5.7 litre V10 engine producing 612 DIN (605 SAE) horsepower (450 kW),whereas the original concept car featured a 5.5 litre version rated at 558 hp (416 kW). Porsche claims it will accelerate from 0 to 100 km/h (62.1 mph) in 3.9 seconds and has a maximum speed of 330 km/h (205 mph), although road tests indicated that in reality the car can accelerate from 0-60 mph (97 km/h) in 3.5 seconds and 0-100 mph (160 km/h) in 6.8seconds. 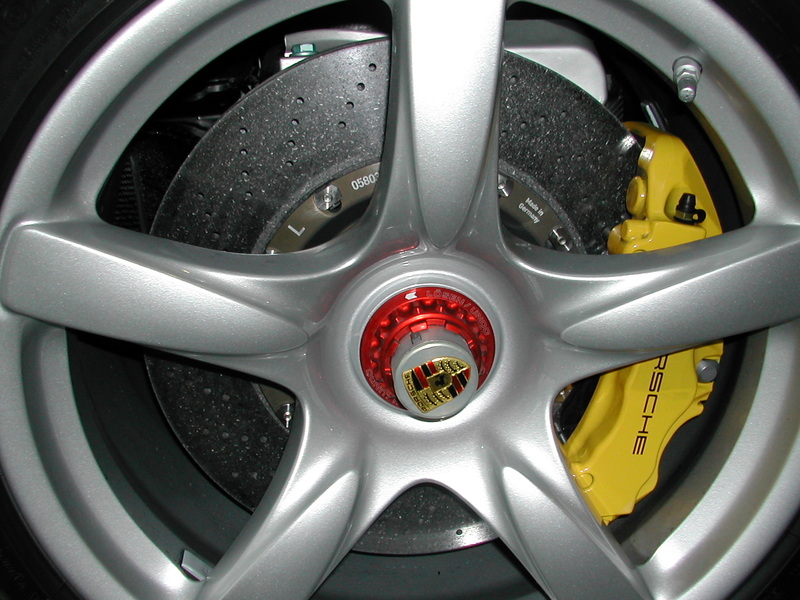 The Porsche Carrera GT has a basic five colour paint scheme which includes Guards Red, Fayence Yellow, Basalt Black, GT Silver and Seal Grey. Custom colours were also available from the factory. A traditional six-speed manual transmission is the only available transmission. Attached to this gearbox is a beechwood gearknob which pays homage to the wooden gearknob used in the Porsche 917 Le Mans racers. In its second year of production, a limited edition carbon fibre knob was also made available. The Porsche Carrera GT has large side inlets and air dams that help cool the large V10 engine framed by the carbon fibre rear bonnet. Fitted with Porsche’s latest Carbon fibre-reinforced Silicon Carbide (C/SiC) ceramic composite brake system, the 15-inch (380 mm) SGL Carbon disc brakes make an impressive appearance underneath the 19 inch front and 20 inch rear wheels. Similar to other Porsche models, such as the Porsche 911, the Porsche Carrera GT includes an automated rear wing spoiler which deploys above 70 mph (110 km/h). The interior is fitted with soft leather. Bose audio system and navigation systems are available as options. In typical Porsche fashion, the ignition is to the left of the steering wheel. This placement dates back to the early days of Le Mans racing when drivers were required to make a running start, hop into their cars, start them and begin the race. The placement of the ignition enabled the driver to start the car with his left hand and put it in gear with his right. Notable technology includes a pure carbon fiber monocoque and subframe, dry sump lubrication and inboard suspension. The carbon fiber monocoque and subframe were produced and assembled by ATR Composites Group of Italy. 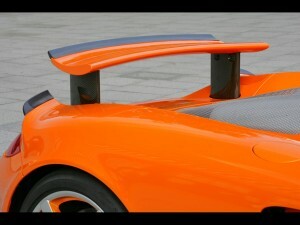 The spoiler of the Porsche Carrera GT extends into the air when the car reaches about 70 miles (110 km) an hour and evens out the air flow, which causes less drag. 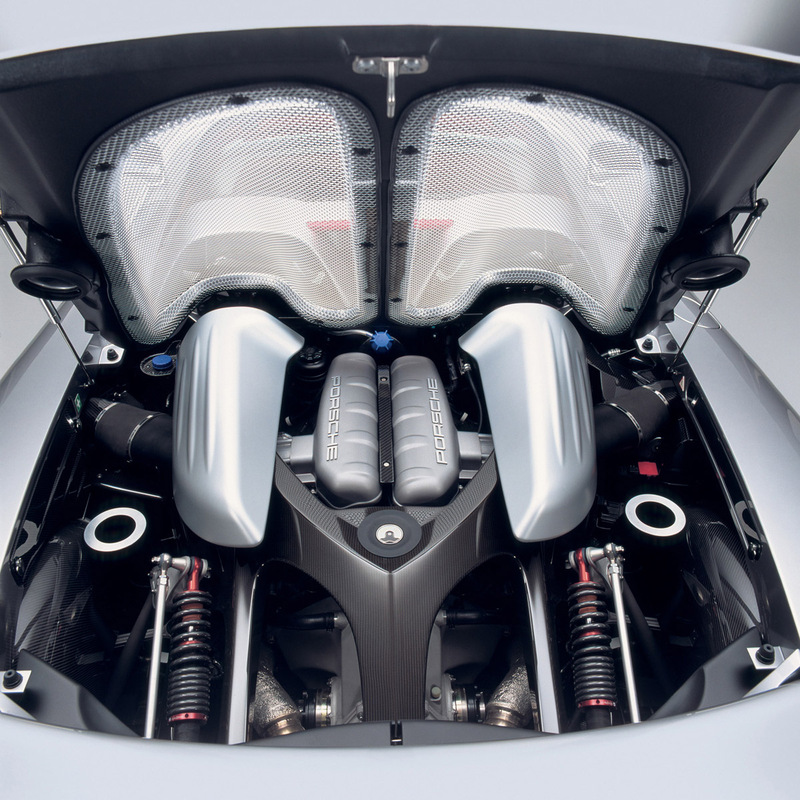 The Porsche Carrera GT radiator is about five times the size of a Porsche 911 Turbo’s. Front and rear suspension consist of pushrod activated shock absorbers and dampers with front and rear anti-roll bars.